There’s no better place in the world for couples to visit than New York City. The city's excitement, culture and entertainment, variety of cuisine from the world’s best pizza and pastrami joints to Michelin-starred restaurants, the seductive hotels, shopping and style are all unsurpassed. Unfortunately, NYC swelters in the summer. So when the sticky months arrive, fan out to explore cooler, greener spots around the state. New York state's two mountain ranges (the Catskills and the Adirondacks) offer lower temperatures at higher elevations. For couples who appreciate beaches and vacationing by the water, New York state boasts three coasts (the Atlantic, Lake Erie, and Lake Ontario) as well as the Finger Lakes, Thousand Islands, Hudson River Valley and Long Island. And don’t forget that thundering marvel that has lured lovers for generations, Niagara Falls at the Canadian border. Held in Syracuse from August 21 - September 2, 2019, the Great New York State Fair shows how agricultural the rest of the state is outside of New York City. The fair also books big-name entertainers. To avoid the mid-day throngs and heat, plan to arrive in the afternoon and stay late. Best Place for Couples to Stay: Turning Stone Casino Resort, about 35 miles away, has a luxurious Lodge (try to score a suite with a hot tub on the deck), upscale Tower accommodations, good restaurants, plenty of gambling and good air-conditioning. One of America's most beautiful race tracks, the Saratoga Race Course season is brief. So plan to visit in summer, when you can see magnificent Thoroughbreds compete between July 11 and September 2, 2019. Opened in 1863, the property has maintained much of its 19th-century grandeur including a sloping grandstand roof with graceful turrets. Hot tip: Make an advance reservation at the Turf Terrace, where you will have a privileged view from the grandstand, watch the action in comfort and enjoy a meal. Best Place for Couples to Stay: Gideon Putnam Resort, a National Historic Landmark from 1935. It's adjacent to Roosevelt Baths & Spa, where you can both drink and bathe in effervescent Saratoga Water. Every year, over the course of nine weeks, the Chautauqua (sha-taw-kwa) Institution at the western edge of New York state serves as a summer camp for thinking adults. The season's schedule includes lectures, ​fine and performing arts, interfaith worship and programs and recreational activities on the grassy complex. Best Place for Couples to Stay: The Athenaeum Hotel is an authentic Victorian hotel on the campus. The rooms are all different and a bit quirky, but for the full Chautauqua experience you'll appreciate staying here to commune with like-minded vacationers. Feel the need for speed? Watkins Glen is New York State's motorsports capital, and the summer season is packed with races and events. The biggest event of the season will be Woodstock 50, taking place August 16-18, 2019. There's a huge lineup of talent awaiting music lovers of all ages. If you promise not to drink and drive, the Finger Lakes Wine Festival at the facility from July 12-14, 2019 is a delicious way to sample NewYork's best vintages. Finger Lakes Wine Country is home to some 100 wineries, and artisanal cheesemakers are also making a splash. Foodies can plot their own wine-and-cheese trail through the region. Best Place for Couples to Stay: Three miles from the racetrack, the Watkins Glen Harbor Hotel stands at the foot of Seneca Lake overlooking the marina, where both cruises and sailing are options to pursue in summer. American comfort food at its Blue Pointe Grille is particularly tasty. Come summer, New York City culture heads to the hinterlands. Set in the wilds of New York state, Glimmerglass mounts more than 40 performances of four different operas during its short summer season in July and August. If your musical tastes run more to "Take Me Out to the Ballgame" (or you love both basso profundo singers and base stealers), know that the concert hall is just eight miles north of Cooperstown. Glimmerglass State Park, a short drive away, has trails through the forest and a beach on the lake. Best Place for Couples to Stay: A grande dame of a hotel right outside of Cooperstown, the Otesaga overlooks Otsego Lake and has a long veranda with Adirondack chairs to take in the placid view. There's really only one reason to visit Corning, but it's worthwhile: The unique and wondrous Corning Museum of Glass. An education in the many uses and properties of glass, the museum is also a place that puts on display exquisite works of art and crafts made from the material. And if you don't mind briefly standing near a blast furnace in summer, you can make your own glass project with the help of a staffer. Best Place for Couples to Stay: Choose one of the hotels in downtown Corning's Gaffer District, where you can experience a variety of shops and restaurants. Built by Standard Oil baron John D. Rockefeller for his family in 1913, Kykuit (pronounced keye-cut) in Westchester County is now open to the public for a fee. On a visit, couples can explore the six-story, 40-room stone mansion, vast garden overlooking the Hudson River and the Coach Barn, which puts classic cars, horse-drawn carriages and more on display. Overshadowing the architecture, the gardens and even the views is the world-class Rockefeller art collection. Terraced gardens display Governor Nelson A. Rockefeller's monumental collection of 20th-century sculpture including works by Picasso, Henry Moore, Alexander Calder, Louise Nevelson and many others. Underground art galleries feature Picasso tapestries among many other priceless treasures. Best Place for Couples to Stay: The century-old Castle Hotel and Spa in nearby Tarrytown has the appearance of a real castle. A member of the Historic Hotels of America, this property includes Equus, a popular restaurant; an Asian-style spa and acres of manicured gardens with Hudson Valley vistas. 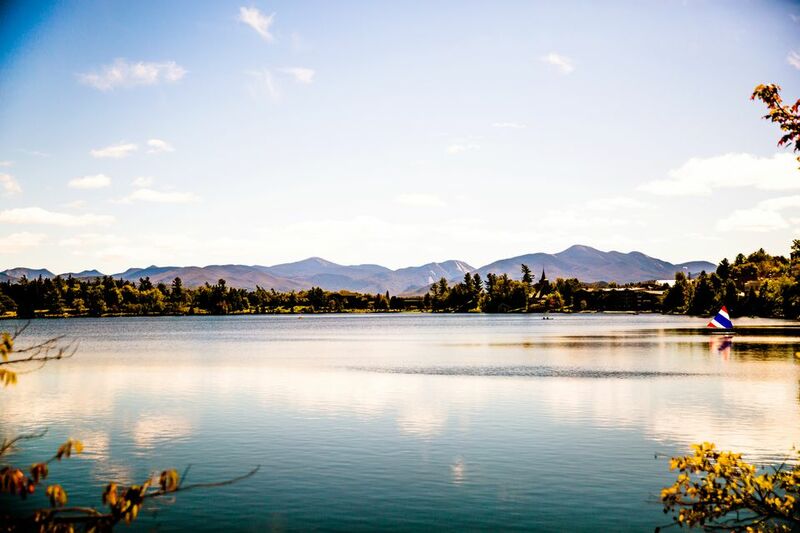 In summer, you can access plenty more additional heart-thumping thrills, from hiking up to Adirondack peaks to zip lining over mountain and forest to whitewater paddling to participating in the 19th annual Ironman Lake Placid. Couples who prefer gentler pursuits can stroll the town, take a canoe out on the lake and visit the Olympic Museum. Best Place for Couples to Stay: The Mirror Lake Inn has been hosting lovebirds for generations. Its fine restaurant overlooks the lake and its spa elicits praise. If you can, stay in the Colonial House, where you get a private porch, lush furnishings and the biggest bathtub we've seen outside of a plumbing showroom. It's been out of commission for many years, but the circa-1869 Saugerties Lighthouse continues to beckon couples in search of an unusual place to stay in New York State. On the National Register of Historic Places, the lighthouse is both a museum and an unfussy inn. Two small bedrooms and the lighthouse tower that's above them provide bird’s-eye views of the Hudson River. You may just spot bald eagles as you celebrate the sunset from on high. The town of Saugerties itself has a few stores and restaurants. For livelier fun, head 10 miles west to Woodstock, where there's more to see, do, and hear in the summer time. Way north in New York State, in the Thousand Islands (actually they number closer to 1,800), there's a particular island of interest to couples: Heart Island, home to Boldt Castle. An American Taj Mahal and equally tragic, the 6-story, 129-room Castle was built by a man in tribute to his wife more than a century ago. After she died suddenly, he never returned to admire the edifice. May through mid-October, Boldt Castle can be reached by water taxi, private boat or tour boat on a day trip. Best Place for Couples to Stay: The Thousand Islands has always been a family-friendly vacation value, so don't expect white-glove service. But you can camp, stay in a waterfront cottage, find cheap and affordable hotels and motels or opt for an AirBnB rental.